Scientists have long known that the yellow colour, or pigment, inside the macular comes from the carotenoids, lutein, zeaxanthin, and meso-zeaxanthin. These plant compounds help protect the eye by absorbing blue light and neutralising free radicals. The patented blend in Macushield brings together all three of these carotenoids (meso-zeaxanthin, lutein & zeaxanthin) to help maintain eye health and more specifically, macular health throughout later years. What foods contain macular pigment? What does macular pigment do in the eye? Why is reducing free radical damage important? Do we get enough macular pigment from our diets? How much macular pigment is enough? What happens if you take Macushield�? How long does it take to rebuild your macular pigment levels after taking Macushield�? Where is Macushield made and what is it derived from? Is Macushield safe to use? Why would you want to take Macushield when it has no vitamins in? Macular pigment is a yellow pigment at the back of your eye which is made up of 3 parts: Meso-Zeaxanthin, Lutein & Zeaxanthin. It is normally obtained from a healthy diet, foods such as Dark Green Leafy vegetables provide the Lutein, and the brightly coloured Corn and peppers provide the Zeaxanthin. Our bodies then convert the Lutein into Meso-Zeaxanthin. Lutein and zeaxanthin, two of the three components of the macular pigment, can be found in a variety of fruits and vegetables (e.g spinach, corn, peppers and most leafy greens). Meso-zeaxanthin, the third component of the macular pigment, is found in slightly unusual foods (such as salmon and shrimp). However, lutein can also be converted into meso-zeaxanthin at the back of the eye. Macular pigment helps protect the retina (back of the eye) from free-radical damage caused by light and oxygen. Protecting against free-radical damage is important as free-radical damage is believed to cause age-related macular degeneration (AMD). On average we consume only between 1 to 1.3mg/day of lutein and zeaxanthin from our diets, considerably less than the amount needed to protect against free radical and light damage. Meso-zeaxanthin is not found in a typically diet. The components of the macular pigment, lutein, zeaxanthin and meso-zeaxanthin, do not have an established recommended daily allowance (RDA), but doses up to 30 milligrams per day are generally considered safe and effective. 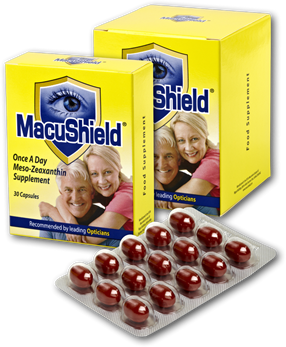 Research has shown that if you take Macushield�, you will significantly increase your macular pigment levels, especially at the centre of your retina where it is believed to be most important. The people who should take Macushield� are individuals who are at risk of developing AMD, and have low macular pigment levels. Research has shown that such individuals include people with a family history of AMD, people who smoke cigarettes, people with poor diets lacking in fruits and vegetables or people who are obese. It is important to note that you can have low macular pigment levels at any age (e.g. 20 years upwards). The importance of meso-zeaxanthin for visual health is reflected in the fact that lutein is converted to meso-zeaxanthin in the retina only, and also because meso-zeaxanthin is only found at the centre of the retina, where vision is sharpest. Also, meso-zeaxanthin is a more powerful neutraliser of free radicals than either lutein or zeaxanthin. Furthermore, the presence of meso-zeaxanthin results in the filtration of a wider range of damaging blue light. Moreover, meso-zeaxanthin is more closely related to vulnerable photoreceptors in the eye than either lutein or zeaxanthin, and is therefore ideally located to afford protection against free radical damage of these important cells of vision. And finally, and most importantly, supplementation with meso-zeaxanthin will ensure that this component of the macular pigment accumulates at the target tissue (i.e. the central retina) in a way that is not dependent on an enzyme to convert lutein to meso-zeaxanthin. Indeed, this enzyme appears to be lacking in many individuals. This differs between individuals, but it generally takes up to three months to rebuild the macular pigment. It is important to note that the macular pigment levels will remain increased for up to six weeks after supplementation, but will fall back down after this time once supplementation is stopped. Macushield is manufactured in the UK and the ingredients that form Macushield are all derived from Marigold leaves grown in Mexico. There are no long term side effects to Macushield, some people have reported that, if taken first thing in the morning before food, an upset stomach is noticed (Macushield is oil based and sits better after food). There has also been a single case in Scotland where an individual has suffered from dry skin for 2 weeks following the start, which has then cleared up. Vitamins are required for general health and do not affect the health of the macula. Macushield is specifically designed to target the macula health, and rebuild the specific macular pigments which protect against free radical and blue light damage. No. The high levels of carotenoids are very difficult to achieve from diet alone. However, previous studies have suggested that people who have diets rich in green leafy vegetables have a lower risk of developing AMD. Do I still need to take Vitamins alongside Macushield? Macushield does not contain vitamins but does not conflict with any additional vitamins that are part of your supplement intake. Because multivitamins contain many important vitamins for the rest of the body, you may want to take a multivitamin along with Macushield. Copyright � 2012 nosepads.co.uk. All rights reserved.